Romaine and Endive are the best choices for taco “shells” because of their sturdy leaves. Enjoy your favorite white, flaky fish or if you’re feeling creative, try this with shrimp. Remove and carefully wash 4 large lettuce leaves and set aside. Rinse and pat dry fish filets, remove any bones. Cut the filets into 1 inch strips and then into 1 inch cubes. Place in a gallon size zip-loc bag and set aside. This can sit up to 2 hours in the fridge. Pour into the bag 1 tbsp of olive oil, sprinkle with salt, pepper, garlic, ½ tsp Cajun seasoning and cayenne pepper. Mix until the strips are well coated. In a small bowl, mix the cabbage 1 tsp olive oil, vinegar, 1 tsp Cajun seasoning, and sweetener. Set aside. Spray a non-stick pan with cooking spray. Over medium heat, cook filets until flaky and cooked through (10-15 min) depending on the thickness of the filets. Remove from heat. Arrange lettuce on a plate, spoon cabbage mixture onto the leaf, then the fish, sprinkle peppers and cilantro, and roll gently to form the wrap. Garnish with lime wedges. Remove and carefully wash 4 large lettuce leaves and set aside. Rinse and pat dry fish filets, remove any bones. Cut the filets into 1 inch strips and then into 1 inch cubes. Place in a gallon size zip-loc bag and set aside. Pour into the bag lime juice and zest, olive oil, cilantro, sprinkle with salt, pepper, garlic, cumin and cayenne pepper. Mix until the strips are well coated. In a small bowl, mix the cabbage olive oil, lime juice and zest, and dill. Set aside. Arrange lettuce on a plate, spoon cabbage mixture onto the leaf, then the fish, sprinkle with extra cilantro, and roll gently to form the wrap. Garnish with lime wedges. 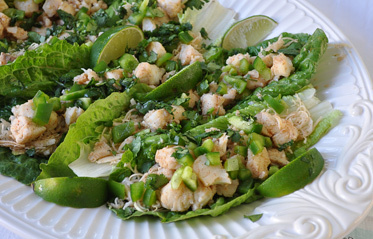 This entry was posted in Entrees, Party & Entertaining, Seafood and tagged cajun, cilantro, easy, fish, fish tacos, healthy, lime, metabolic diet recipes by foodies4mmc. Bookmark the permalink.